Congressman Duncan Hunter of California personally removed a student art contest painting from the wall of a U.S. Capitol office building late last week, claiming he was exercising his First Amendment right to express disapproval of the work because he was offended by its depiction of police with animal heads. Fellow Rep. Lacy Clay of Missouri feels quite differently about the removal of his constituent’s artwork, however, and is pressing Capitol Police to file charges against Hunter for theft. As of this morning the painting was back up after Clay and other members of the Congressional Black Caucus restored it. 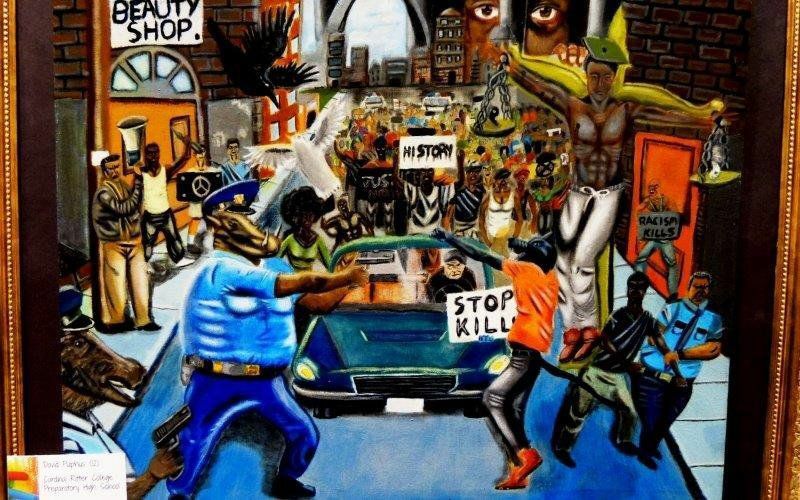 Last spring a panel of artists from Missouri’s 1st Congressional District, which covers part of St. Louis as well as some northwest suburbs including Ferguson, selected the painting to hang in a corridor of the Cannon House Office Building alongside other youth artwork from across the country. Pulphus completed the painting while he was a student at Cardinal Ritter College Prep High School in St. Louis. This constitutionally protected freedom is essential. The right to express one’s thoughts and to communicate freely with others affirms the dignity and worth of each and every American, regardless of their point of view, and regardless of who might be offended. If there’s a process to remove this painting, well, let’s start the process. And let’s discuss it. But you just don’t walk up here and remove a painting because you are offended by it. Within a few hours after the painting was re-hung this morning, though, that’s exactly what yet another Congressman did. This time it was Rep. Doug Lamborn of Colorado, and within 15 minutes the artwork was once again back up courtesy of Rep. Clay.